Join the #JusticeMatters campaign. 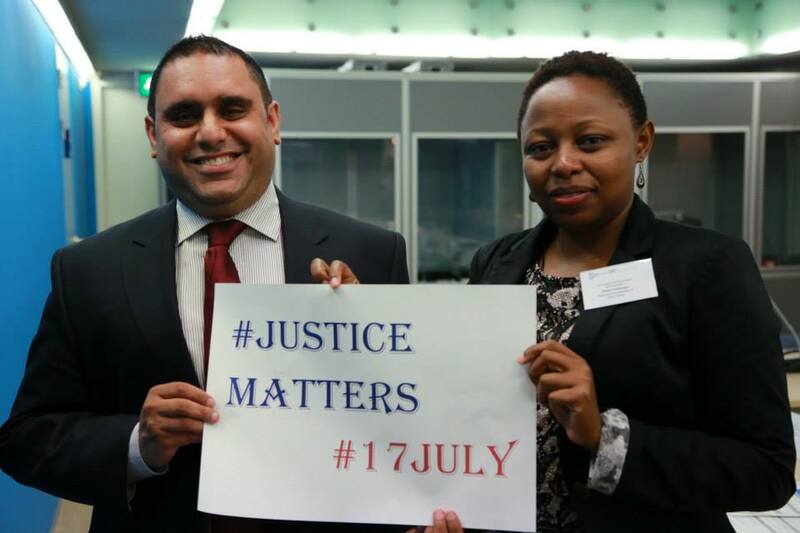 Post a photo of yourself on Twitter or on the IJD Facebook page holding a sign reading #JusticeMatters. Change your social media profile image to the #17July logo. Join the conversation using the #JusticeMatters and #17July hashtags. Tune into to our live IJD video conference “Can the UN Security Council be Consistent on Justice? on 16 July at 10:00am EDT/16:00 CET on our Google+ and YouTube pages. Send us questions on Google+, YouTube, Facebook or Twitter using the #UNSCJustice hashtag. Amnesty International (AI) made public the names of CAR militia members suspected of ordering or committing atrocities. Seleka rebels reportedly killed 17 in an attack on a Catholic church compound. The UN World Food Program warned that escalating violence in the CAR is threatening humanitarian aid, limiting resources and hindering relief workers in the area. The Ugandan military denied claims that its forces are looting in the CAR. Kenyan Attorney General Githu Muigai and ICC prosecutors disagreed about the scope and dates of documents sought by the prosecution in the case against Uhuru Kenyatta. Muigai accused ICC Prosecutor Fatou Bensouda of requesting documents that are irrelevant to the Kenyatta case. He also told ICC judges that Kenyatta’s financial records can only be released with Kenyatta’s consent, and that the Kenyan president’s land records cannot be found. Kenyatta’s defense counsel criticized the ICC, accusing the Court of being indecisive and allowing the case against Kenyatta to continue despite a lack of evidence. ICC judges rejected prosecution pleas to keep confidential eight medical reports on victims of the post-election violence in the William Ruto and Joshua Sang case. ICC suspect Omar Al-Bashir traveled to Qatar for bilateral talks. At the prompting of ICC judges, the ICC registrar requested his arrest. The Sudanese president will reportedly visit Egypt soon after receiving an invitation from the Egyptian president. Eighteen people were killed in a tribal clash, as the fighting for resources and retaliation increases in Darfur. Human Rights Watch (HRW) urged Dutch authorities to reconsider the decision to deport three ICC witnesses, but they were sent back to the DRC. Meanwhile, AI called on Congolese authorities to ensure that the three witnesses do not face the death penalty, torture or other serious human rights abuses. The International Refugee Rights Initiative’s Olivia Bueno examined different opinions on whether or not the witnesses deserved asylum. The Guardian criticized the DRC’s prime minister for failing to admit that sexual violence is used as a method of torture by Congolese authorities. A Daily Monitor columnist urged the Ugandan government to expedite reparations for victims of the conflict with the Lord’s Resistance Army (LRA). Sam Opio, a senior LRA leader who defected last week, denied having any contact with Joseph Kony or knowledge of his current location. The Christian Science Monitor reported that clashes between Ugandan forces and the Seleka militia in the CAR could jeopardize anti-LRA operations as well as the peacekeeping mission in the CAR. The UN mission removed some of its staff from Libya due to deteriorating security conditions. Malian government officials announced that they will meet with northern rebels and attempt to resume peace talks on 16 July. Meanwhile, Algeria proposed a regional meeting to tackle the crisis in Mali. In a letter, HRW called on Colombia to withdraw its military jurisdiction expansion bill, warning that trying human rights offenses in military courts undermines the independence of judicial proceedings and could expose Colombia to an ICC investigation. The FARC rebels and the Colombian government announced plans to continue peace talks on 15 July and will focus on reparations for victims. Sixty-three of the over 200 schoolgirls kidnapped by the Boko Haram escaped during a major attack on the group in Nigeria. Civilian casualties have increased in Afghanistan due to ground combat and crossfire, according to a UN report. Parliamentarians for Global Action (PGA) conducted a mission to Togo to gain political support for joining the ICC. PGA welcomed Sweden’s new law criminalizing crimes against humanity and providing for universal jurisdiction over international crimes. The Palestinian Center for Human Rights and other organizations urged Palestine to join the ICC immediately. Haaretz reported that the Palestinian president is expected to move to join the Court. However, academic blogger Mark Kersten argued that legal and political obstacles make it unlikely the ICC will get involved in Palestine. HRW, AI and the International Commission of Jurists called on Nepal to amend its Truth and Reconciliation Commission Act to preclude amnesty for international crimes. Court officials concluded a seminar on cooperation with the ICC in Ghana. This week, officials from the ICC and other courts spoke at an IJD event in The Hague, while the New York City Bar Association issued a statement commemorating IJD and welcoming the US’s increasingly close relationship with the ICC. Coalition members are organizing many more events around the world.